A punch card allows you to sell and keep track of a service that you offer. A good example would be classes; if you offered a spin class you could use a punch card to sell 10 sessions (or any arbitrary number of sessions) of the spin class to your customer. Additionally, we also have the ability to create punch cards that have an unlimited number of sessions. A punch card with an unlimited number of sessions would be useful for tracking an add-on service that the customer is paying monthly for, such as child care or locker rentals. To create a punch card, first find (or create) either a regular account or a guest account for your customer. Once the account has been created, scroll down to the bottom of the account screen and click on the add a punchcard button. The next screen will be where you enter the specific details of the punch card (see below). First select the item that the new punch card service will be billed to. 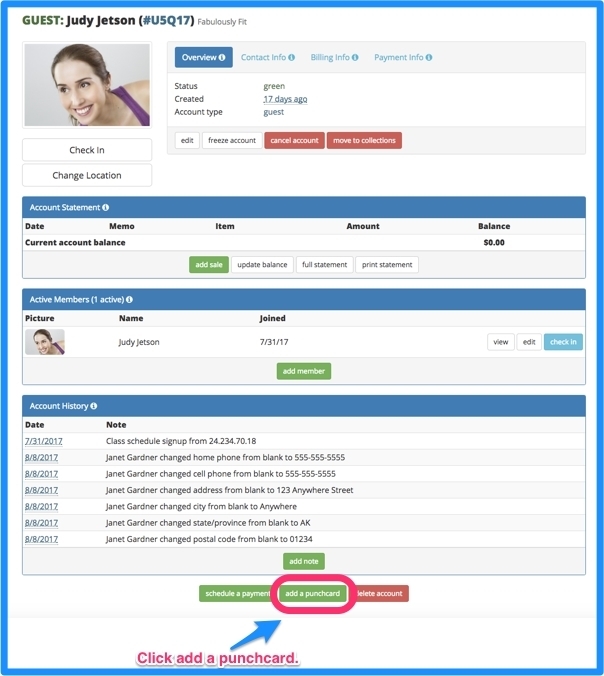 This can be a built in account such as Personal Training or any custom revenue account that you’ve created. Enter the title for this new punch card. The title should be something short and descriptive such as: 10 Sessions of Pilates. Single session – this is for exactly 1 session. An introductory personal training session would be a good example. Multiple sessions – Enter any number of sessions. This is the most common type of punch card and it is also the default choice. If you’ve chosen the Multiple Sessions type of punch card, enter the total number of sessions here. Unlimited sessions – Choose this option if the customer is paying monthly for this service and you just want to keep track of how many times they use the service. Child care or monthly locker rentals would be good examples for this type of punch card. Enter the total amount that the customer will pay for this punch card. If you enter 0 no payment will be collected for this punch card. If you enter any number other than zero the next step of the punch card process will be the sales screen where you can enter payment details for the punch card. If you’ve entered a total amount for the punch card (other than 0), you will be taken to the payment entry screen after clicking on the save punchcard button. If the payment fails because the customer’s credit card and bank account declines the charge the punch card will not be created. If the payment is declined but you still would like to complete the sale to the customer, you can always re-enter the punch card with a zero total amount or select cash as the payment method. Enter the number of days before the punch card sessions expire. If you don’t want the sessions to ever expire than simply enter 0 in this box. If you check the Check-ins use up sessions box, every time the customer checks in using their membership card one of the sessions for the punch card will be used. Furthermore, if you check this box, a second check box that gives you the option to disable the customer’s key once all sessions are used will appear. 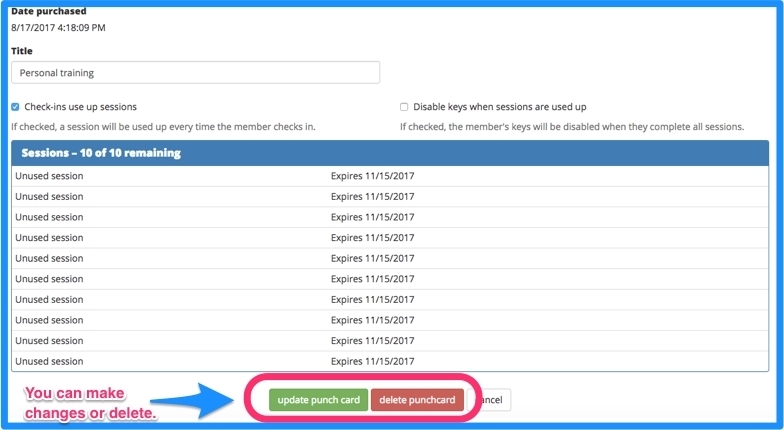 If you check the disable keys box, then once all sessions of the punch card have been used the customer’s key cards will be disabled so that they can no longer access your club without first visiting the front desk. When you have finished, click save punch card. Finally, once you’ve completed the punch card creation and accepted the payment for it, you will see the new punch card and its details on the account screen. When you would like to use a session from the punch card simply click the check in button next to the punch card and one of the sessions will be deducted. You can view all of the sessions used and undo any accidental check ins by clicking on the title of the punch card. From the edit punch card screen you can also update the title, change the options, or even delete the punch card.